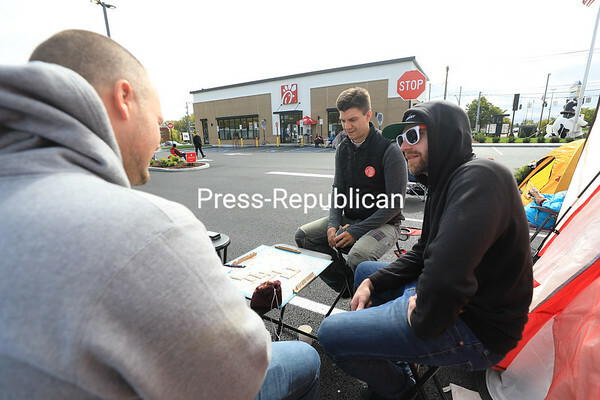 Friends Zach Stephenson (left), Keith Sampere (center) and David Perry enjoy a game of Scrabble as they kill time while participating in the Chick-fil-A First 100 Campout outside the new Plattsburgh eatery. The 24-hour long event, which started at 6 a.m. Wednesday, invites locals to stay overnight in the Chick-fil-A parking lot to earn 52 free chicken sandwich meals. Stephenson, an experienced Chick-fil-A’s First 100 Campout participant, told his friends in advance to get the day off so they could join in on the fun. Stephenson and Sampere traveled from Vermont; Perry lives in Plattsburgh.